The Year of the Pig marks the 8th Annual Central Florida Dragon Parade Lunar New Year Festival held in Orlando, Florida. The Year of the Pig marks the 8th annual Central Florida Dragon Parade Lunar New Year Festival held in Orlando, Florida. This event has received an overwhelming response from local and distant communities alike. Again this year, Asia Trend Magazine is partnering with Mills 50 District (an Orlando Main Street District), R.E.A.C.H. of Central Florida (Recognizing Educating Asian Cultural Heritage) and Y.E.S.S. 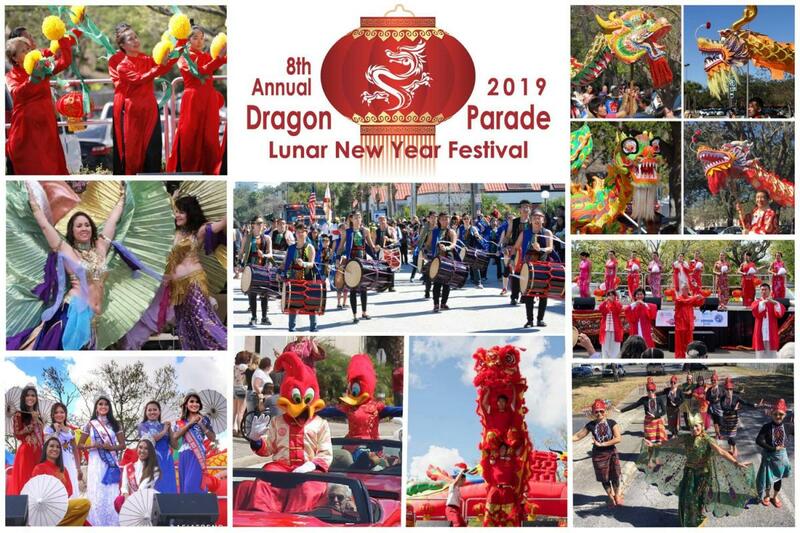 (Youth Enrichment and Senior Services) to host the Dragon Parade Lunar New Year Festival on Sunday, February 17 from 11:00am to 4:00pm at 728 N. Thornton Ave., Orlando, FL 32803. The festival parade starts at the corner of Lake Highland Dr and N. Mills Ave, left turns at N. Thornton Ave, heading south and ends at N. Thornton Ave and Colonial Drive. The Dragon Parade, which precedes the Festival, is led by City of Orlando and Orange County officials together with representatives of numerous Asian organizations. The parade will be followed by four hours of the Lunar Festival that will take place at 728 N. Thornton Ave., Orlando, FL 32803. The Lunar New Year Festival will feature Asian entertainment including Dragon dancing, Lion Dancing, cultural dances, martial arts, taiko drummers, arts and crafts and Asian food. In 2018, over 8,000 patrons attended the event. We would like to invite you or your organization to be part of this community event by becoming a sponsor, a vendor, or a participant. Join businesses like Wyndham Destinations, 1st Oriental Supermarket, Payas Payas Payas LLP, Taiwanese Chamber of Commerce Greater Orlando, Maaswinkel Law and Universal Orlando and become one of our event sponsors.